According to the World Bank’s president Jim Yong Kim, corruption is the public enemy number one of the developing countries. It is hard to argue with this statement since corruption negatively affects the quality of life of billions of people, results in ineffective public governance, further increases income inequality and leads to considerable loss of GDP in many of these countries. The question remains; what leads to corruption and how to reduce it? Surprisingly, there is little information and even less research on the subject. Bo Rothstein, professor at the University of Oxford and head of Quality of Government Institute in Sweden, visited Booth last week and provided some insights into how Scandinavian countries managed to eradicate corruption. So, what is corruption? Corruption occurs whenever those entrusted to manage public goods turn them into private ones for their own benefit. In the early 19th century, Sweden and Denmark were a case study of fraudulence; absence of meritocracy, buying and selling of civil and military positions, aristocratic privileges, no clear division between public and private money. Seldom did the Justice enforce the laws. Rather, they were viewed as merely a starting point for negotiations. Direct bribery, however, was quite unusual. One would have expected this state of decadence to persist but, surprisingly, corruption in Denmark and Sweden essentially vanished by 1850 and 1875, respectively. In Sweden alone, 30 major institutional changes were implemented in a 25-year time. An avalanche of reforms led to an overhaul of the entire political system that went from particularism and personal rule to universalism and impartiality. But why did this happen? And why did it not happen elsewhere? A strongly and commonly held belief is that democracy is the sine qua non condition to get rid of corruption. Surprisingly, data show that it is hardly the case. The relationship ‘democracy-corruption’ is U-shaped and doesn’t display any clear correlation either way. 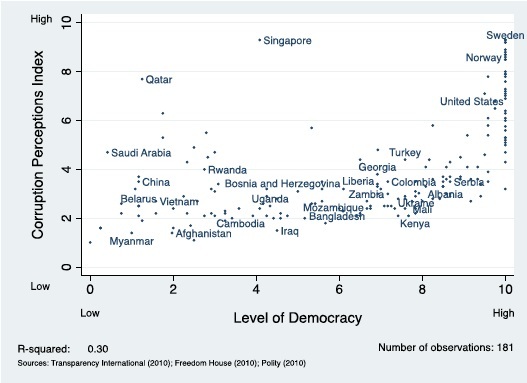 While countries that have the highest levels of democracy clearly fight corruption more effectively than average, the correlation breaks down when we look at countries in the middle and low end of a the democracy spectrum. Graph shows relationship between democracy and corruption. According to Mr. Rothstein, a high quality of government and healthy audited public institutions are the necessary conditions to have a non-corrupt country. The problem is that these changes have to come from the inside and cannot be imposed from the outside. For instance, in the late 1980s, The World Bank embarked on a crusade to implement good governance in developing countries, with disappointing results by any measure. There was not a single case where the intervention of The World Bank resulted in any sustainable improvement. One thing becomes clear when we look at corruption from a principal-agent perspective: Having one honest principal (leader and inner circle) changing the incentives for agents (whole political system) is no way to solve the problem.. If that was the case, more countries would have fixed the problem a while ago. Corruption leads to redistribution of wealth from the bottom to the top, so it is dangerously naive to expect the principals to change the incentives. Bo Rothstein is a Professor at Oxford and and head of Quality of Government Institute in Sweden. Source: www.bsg.ox.ac.uk. Let us go back to Denmark and Sweden. The level of corruption in these countries was so high at the time that there was a credible threat to their survival. Sweden even lost a significant fraction of its territory (Finland) to the Russian empire. Once they reached that point, a consensus emerged amongst the general public and elites as everyone agreed that something had to change to sustain sovereignty. This led to a massive U-turn in public policy towards more meritocracy and rule of law with the outcome that we all know. Even though we do not understand all the dynamics involved in corruption, here are a few safe conclusions: high levels of corruption exist in countries with poor governance, democratization is not an answer to the problem of corruption, rational agents are not likely to generate the institutions required to fight corruption, a ‘big bang’ is needed to fuel the change towards non-corrupt governments and societies. In the current context, a valid question remains: could the current protracted oil crisis be such ‘big bang’ for some resource-dependent countries? Only the future will tell us. Alex is a first year from Russia, whose interests span from finance and international politics to DJ-ing and extreme sports.